An LM311 in a comparator circuit is shown at the right, with the pin numbers for the connections. The open-collector output is at pin 7, and the ground for this transistor is at pin 1. It is shown pulled up to the logic voltage of +5 with a 1k resistor, which is typical. 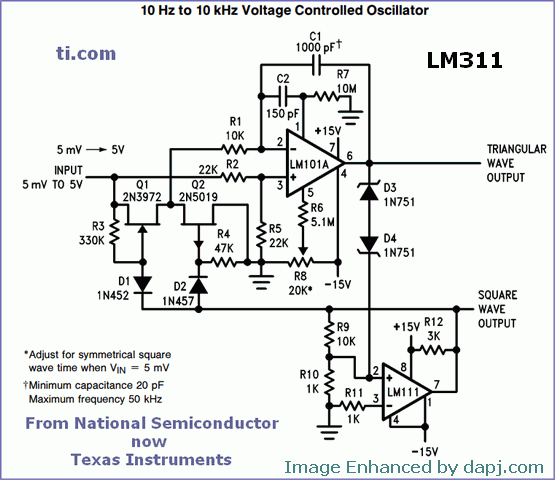 The output of the LM311 can sink 8 mA. A comparator’s output is essentially binary, YES or NO. AN9510.2 October 19, 2004 – This is an Analog Reference for the Embedded Engineer. 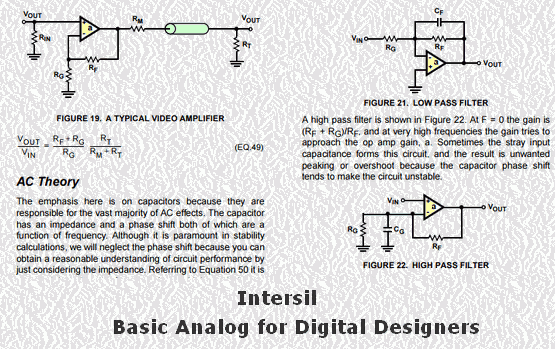 An Application Note from Intersil Tech Reference. Ever wanted to develop a Professional High Speed DAQ or a Storage Oscilloscope or even a High Speed Communications grade Logic Analyzer. Here is a front end Analog Mixed Chip with Eval Board. The DRS chip is a full custom Integrated Circuit developed at PSI, Switzerland. It contains a switched capacitor array (SCA) with 1024 cells, capable of digitizing eight analog signals with high speed (6 GSPS) and high accuracy (11.5 bit SNR) on a single chip. By using channel cascading, we can configure this board with 2048 bins for each channel at the expense of a lower analog bandwidth of about 500 MHz. The on-board comparators enables the board to do a self-triggering on a programmed level of any of the input channels or logical combination of channels, much like an oscilloscope. Active input buffers which result in an analog bandwidth of 700 MHz (-3dB). 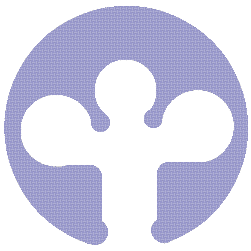 Internal trigger with user-defined thresholds on any of the four channes. Some of products are – 1-Wire and iButton designs, Amplifiers, Analog Switches and Multiplexers, Clock Generation and Distribution, Data Converters, Design Services and Analog IP Blocks, Digital Potentiometers, Embedded Security, Energy-Measurement and Metering SoCs and more. The Novato reference design is a 16-bit, high-accuracy, loop-powered temperature transducer that transmits temperature information from a remote object to the central control unit over a 4-20mA current loop and using the highway addressable remote transducer (HART) communication protocol. The modular design kit for the XMC4500 series. Up to three additional application boards – for actuators and sensors (top), for human-machine interface (HMI) functions (right), and for communication with other systems (left) – can be connected to the basic design board with XMC4500 (middle), depending on the respective application requirements. Manufacturer of Semiconductors that are used in Power supplies for products like cell phone chargers, set-top boxes to industrial controls. Fairchild Components are used in Mobile and Handheld Devices for power, backlighting and signal conditioning solutions for a longer battery life.